Social marketing is receiving unprecedented focus and support from government, the private sector and charities internationally. Social marketing attempts to educate people in the hope that they will make ‘informed’(i.e. healthy) choices regarding diet, lifestyle and health related issues. The effective application of social marketing principles can be complex and controversial. Social marketing planning cannot be reduced to a simple set of actions on a checklist; there is no single strategy for success and strategies that have proved successful with one population may not transfer to other populations. This text will explore the complexities involved in researching, planning and implementing effective social marketing programmes, using illustrative cases from both successful and unsuccessful real-world programmes. The authors provide a critical analysis of the origins of social marketing as a concept and of the claims made by its supporters and detractors in order to highlight what social marketing can and cannot achieve. This is followed by a review of strategic issues that must be considered in developing social marketing programmes, including persuasion resistance, message relevance and message framing. Key themes included in the text are the impact of cultural factors on health-related behaviours, ethical issues and attitudes as a key factor underlying health-related behaviours. The authors introduce concepts, theories and strategies that will aid the development, testing and implementation of social marketing interventions. 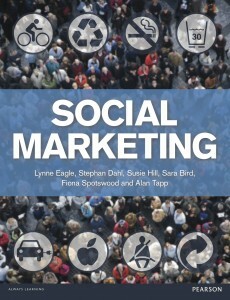 The book is suitable for both undergraduate and postgraduate students of business and marketing and those studying modules in social marketing. 1. What is social marketing? Is theory really useful in practice? So how much should we spend?